These magnificent new silver bullion coins are an extension of the Royal Canadian Mint Silver Maple Leaf Program. 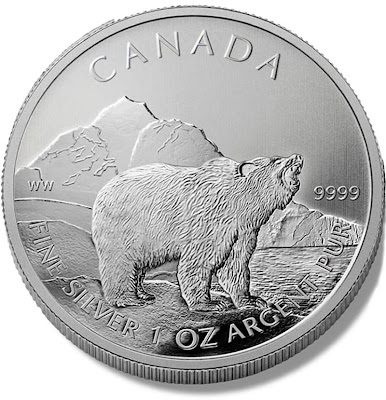 This is the second coin in a 6-coin series being released over the next 3 years; Each new coin will have a wildlife theme. The Grizzly Bear design by Senior Mint Engraver William Woodruff depicts a growling Grizzly Bear alongside water with magnificent wildlife scenery behind it. The maximum mintage is 1 million coins making them 30 more rare than an American silver eagle. They are more pure than an eagle at .9999 fine silver and have a legal tender face value 5 times than an silver eagle. These coins are in high demand with bullion buyers and collectors worldwide.